Cheltenham’s November meeting, better known under its previous guise as The Open or even the Paddy Power, is so popular that its reputation is largely untouchable. Even if the racing doesn’t come up to scratch, it can be relied upon to be revered as the gateway to the Jumps season proper. A ritualistic pilgrimage for many racing fans and long-standing members of the course to renew old acquaintances over a bevvy or six. 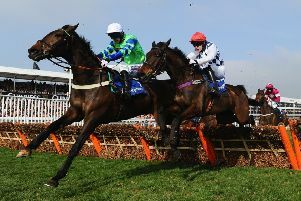 Splash of Ginge, the surprise 25/1 winner of the big race of the November meeting at Cheltenham, the BetVictor Gold Cup. (PHOTO BY: Julian Herbert/PA Wire/PA Images). Attendance figures duly stood up well over the three days last weekend, with more than 68,000 flocking through the gates. But did that make the meeting a success in the eyes of punters and racegoers? It’s doubtful that you will discover much disapproval within the racing media, large swathes of which, as I have touched on before, take unashamed glee in extolling the virtues of the Jumps game at the expense of the Flat. I even read one headline describing the meeting as “exhilarating”. That’s the last word I would have chosen and is concrete proof of how its reputation can precede reality. In fact, at times, I found it hard work, which is something I never thought I’d say about Cheltenham. It was certainly the most underwhelming November meeting I can remember. Maybe the weather was to blame. The track was bathed in rain on Saturday, spoiling the occasion for racegoers, ruining the ground and dislodging the credibility of the form. Of course, that wasn’t the track’s fault. As late as 8 am on the day, not a drop of rain was forecast, yet it proceeded to bucket down for the best part of six hours, dropping 12mm. Simon Claisse, Cheltenham’s experienced and admirable clerk of the course, was right to bat away criticisms and ridiculous accusations of pre-meeting over-watering. But at the same time, the extent to which the rain affected the ground, which deteriorated alarmingly, was very disappointing. It meant that a sizeable portion of Saturday’s card and all of Sunday’s card were run on a surface described by one jockey as like ploughing through PVA glue. And while, surprisingly, it did not result in a surfeit non-runners, it did create the kind of unsatisfactory track bias normally associated with the draw on the Flat, rendering the wide outside palpably the best place to be. Saturday still yielded, for the most part, an interesting, competitive seven-race card, even if the number of runners was down by about 20 per cent on the corresponding day the previous year and punters were riled by a couple of 25/1 winners, including SPLASH OF GINGE in the feature race, the BetVictor Gold Cup. But surely it is time for Cheltenham to beef up the fare on Friday and Sunday. Six-race cards have no justifiable place at any meeting outside the Festival itself, Royal Ascot and York’s Ebor meeting, and their limitations are exposed even more when, as was the case on Friday, one of the races is a cross-country chase and, as was the case on Sunday, one of the races is a Bumper. Personally, I can handle as many Bumpers as can be thrown at me, but most racing fans can’t. As for cross-country races, they are tedious, tiresome affairs, the relevance of which has been diminished by the advent of veterans’ chases. With the schedule blighted even further by a chronic shortage of runners in the novice events which, granted, is a problem not unique to Prestbury Park, the package on offer became seriously diluted. Over the three days, the five novice events over fences and hurdles featured just 21 horses. Of their winners, FINIAN’S OSCAR is clearly potentially top-class, but his main rival, WILLIAM HENRY, was never at the races; NORTH HILL HARVEY is a likeable young chaser, but his main rival, RIVER WYLDE, hated the ground; BLACK CORTON shed more light on the rise of jockey Bryony Frost, but one of their two rivals, WEST APPROACH, jumped poorly; and while SLATE HOUSE looked a lovely prospect in the 2m hurdle, the favourite, DAME DE COMPAGNIE, did not perform and the race was reduced to near-farce by the omission of three flights because of low sun. Don’t let me ride that particular hobby-horse, but suffice to say that the issue of low sun, coupled with the sad death of the talented dual-purpose horse, LONDON PRIZE, in the Greatwood Hurdle was enough to have me trudging for the exit long before the concluding Bumper on Sunday. Of course, I will be back. I might be a hack, but I’ve been a member there for more than 25 years. Cheltenham remains the magnetic Mecca of Jumps racing. The Festival is a sporting event beyond compare. I love the December meeting, and Trials Day in January is not to be missed. But I just wonder if it’s time to run the rule over the November offering and ask if it is still serving its purpose effectively. Certainly, if a meeting is to be judged by the quality of its performances, then the 2017 renewal came up short. With the exception of FOX NORTON, who oozed class in the Shloer Chase, and the Nicky Henderson hurdlers APPLE’S SHAKIRA, who took apart the juvenile hurdle on her UK debut, and ON THE BLIND SIDE, who looked an embryonic contender for the Albert Bartlett at the Festival, very little got me over-excited. Maybe the format needs surgery. A cursory glance over the 19 races suggests the three-day menu could be comfortably condensed into two. That is unlikely to happen, given the demand that is reflected through the aforementioned attendance figures and given that each day boasts its individual, long-established theme. But it’s a culling operation that Newbury has pulled off successfully with its Hennessy meeting, now transformed into the Ladbrokes Winter Carnival. The sponsors are working feverishly to turn this two-day extravaganza into one of the highlights of the season, both in terms of prize money and quality of race, so it will be interesting to compare next week’s experience with that which has just drifted by at Cheltenham.